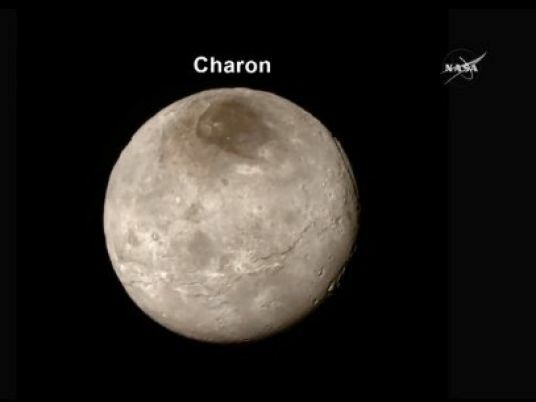 Images from the New Horizon space probe suggest that Pluto's moon Charon once had a sub-surface ocean that has since frozen and expanded, causing the surface to stretch and fracture, NASA said. Charon's surface was photographed by the New Horizons's Lorri (Long-Range Reconnaissance Imager) camera as the spacecraft flew past the moon in July 2015 at a distance of 78,700 kilometers. The detailed pictures show a system of "pull-apart" tectonic faults on the moon's equator. These faults and fractures run "at least 1,100 miles [about 1,800 km] long and in places there are chasms 4.5 miles [7.5 km] deep. By comparison, the Grand Canyon is 277 miles [446 km] long and just over a mile [1.6 km] deep," NASA said on Friday. Charon's outer layer today is mainly water ice. But millions of years ago, when Charon was young, scientists believe that layer was kept warm "by heat provided by the decay of radioactive elements, as well as Charon's own internal heat of formation." "But as Charon cooled over time, this ocean would have frozen and expanded [as happens when water freezes], lifting the outermost layers of the moon and producing the massive chasms we see today," NASA said. Pluto, a dwarf planet in the far reaches of the solar system some 5.8 billion km away from the sun, has five moons. Charon, with a diameter about half that of Pluto, is the largest of them. Experts believe that oceans on Europa, one of Jupiter's moons, and on two of Saturn's moons, Ganymede and Enceladus, are the best places in the solar system to look for microbial life forms.